If you are a construction specialist who needs a portable means of lifting heavy objects then Genie SLA lift hire could provide the answer to your working at height problems. 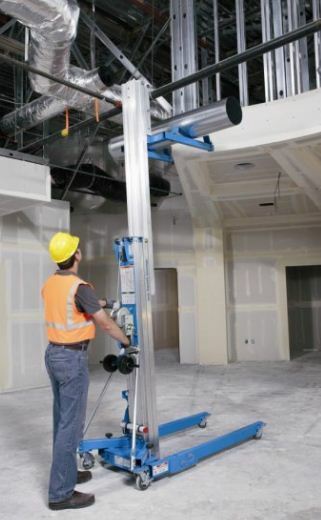 Contractors, especially mechanical and electrical engineers, often need to lift heavy materials to ceiling areas to help them complete their tasks and a Genie SLA Lift makes manoeuvring heavy equipment easy. Genie Lift – £80.00 per week. Extension Forks – £20.00 per week. With a lifting height of up to 26ft, this compact piece of equipment is easy to operate and use. You can hire it with just simple phone call and the kit will be on site in perfect working order, next day guaranteed. Genie SLA Lift hire is the obvious answer especially if you are undertaking a one-off job. It has a wide range of accessories, including the Genie access platform, all of which are specially designed to ease the burden on your working day. And with a lifting capacity of nearly 300kg, you can rest assured that when you opt forGenie SLA Lift hire, it definitely won’t let you down. WHY USE A GENIE LIFT HIRE? The heavy duty design has a patented telescopic mast system and a captive stabilizer set making the whole structure highly durable and super secure. It is so compact it rolls easily through a standard door and the legs fold down so it can be safely stored away. The roller wheels have swivel locks and side brakes offering you both manoeuvrability and security. When you opt for Genie SLA hire you know it will be a fast set up which needs no extra tools so you can get on with the job in hand. Operation consists of a one speed manual winch. With a worldwide proven track record in handling heavy goods, the Genie SLA is the ideal safe and secure solution for your heavy lifting needs.